Welcome back. Love your new WBs...Beautiful. WB is awesome BUT the Launchbar and big round Weather/Clock are no where to be found. Thanks for the info Vad. Appreciate it! 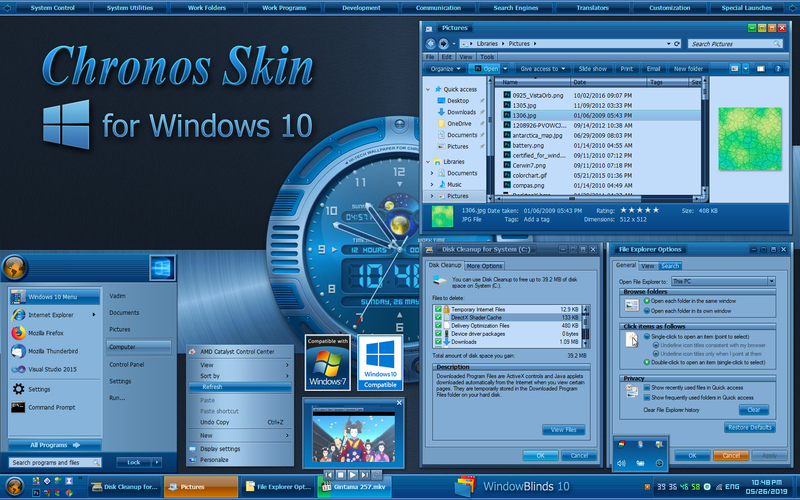 It's a pleasure to see that you are still skinning and keeping your wonderful Chronos suite functioning for the newest operating systems. Nice work, great to see you back! Nice looking skin. Placing the roll-up button next to the close button means I actually have to pay attention when I click, which I guess is a good thing Firefox 56 rolls-up properly too, which is not always the case. Awesome seeing this style of blind again! And the interplay with other Stardock products is much missed. We have been stuck in a rut of pricey pattern recolors and such with little variations. Thank you. Keep the spirit of skinning in mind with your future creations. THANK YOU!! I am SO Happy to see these awesome older styles redone for Windows 10!